There must be people who like going to the intu Eldon Square. 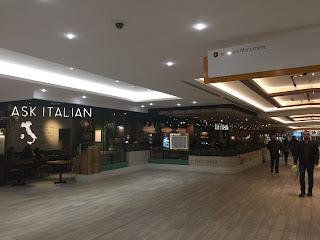 There may even be people who know why intu spells its name with a lower case i. I am not one of those people. It’s not intu’s fault, of course. Why did Newcastle’s glorious frontage of beautiful Georgian architecture have to get in the way of modern commerce so we’re left with a rabbit warren of tiny shops behind the facades? Mind you, despite its drawbacks, the intuitive people at intu (that was a guess) are doing something right. For they sure know how to extract our pounds. 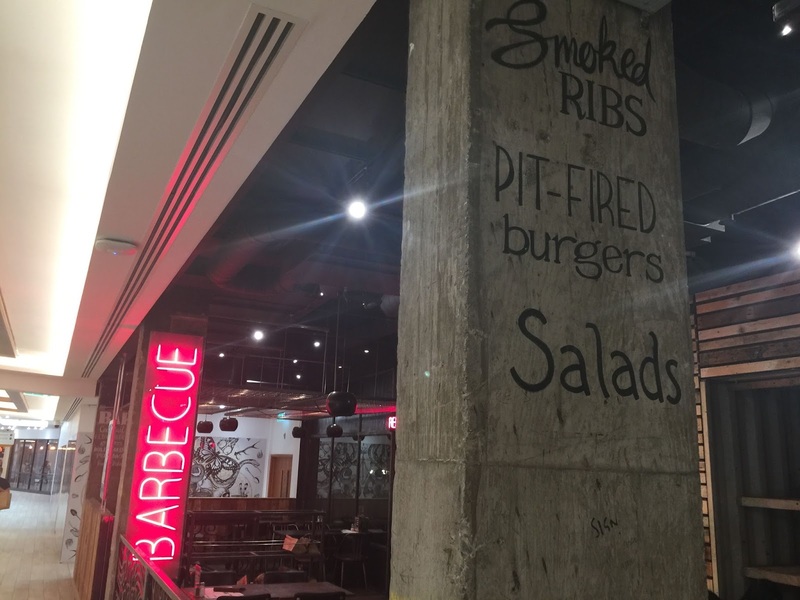 They’ve recently spent gazillions on a new section called Grey’s Quarter, and filled it with chains like Ask Italian and Giraffe, George’s Great British Kitchen and Smashburger. Fast food to revive flagging spirits. When this gastronomic lineup was announced, those of us who favour independent restaurants sighed and tutted. But it’s not all plastic menus and pre-packaged sauces. 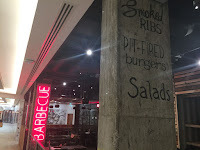 They have a decent barbecue place called Red’s True Barbecue, which I reviewed quite generously the other week; and now it has Omar Allibhoy. Ladies – this one is for you. 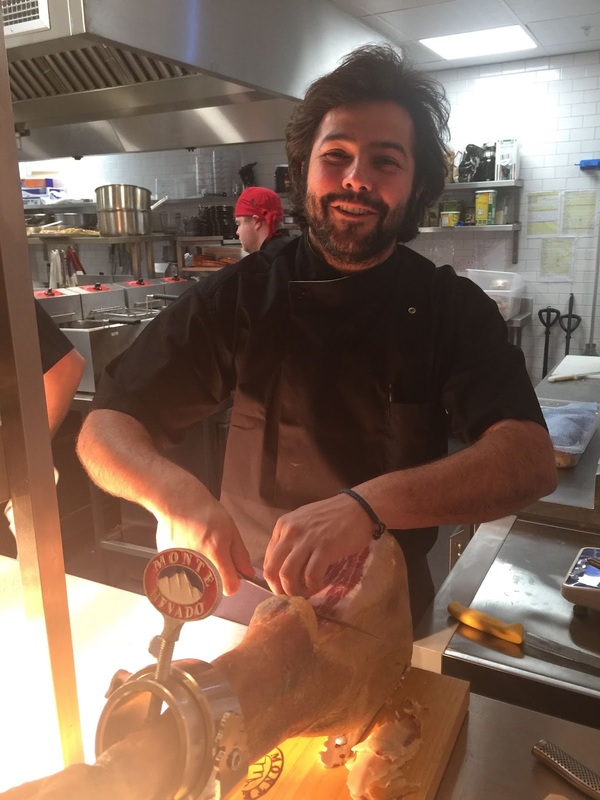 Omar is the pinup of Spanish cooking, the James Martin of Madrid. He cut his perfect white teeth in what was then the world’s greatest restaurant, El Bulli in Catalonia. He graduated to Gordon Ramsay’s Maze, thence to the hopelessly trendy El Pirata in Notting Hill. 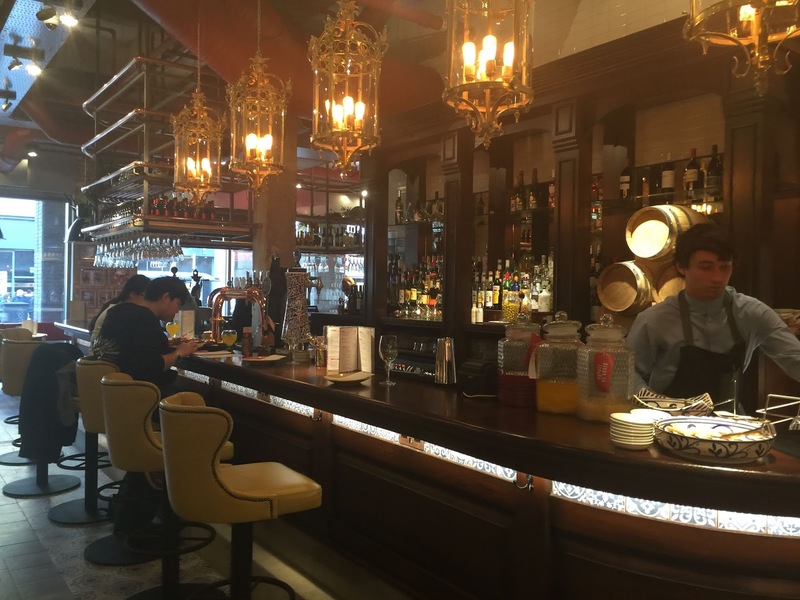 With his rugged, rakish looks, Allibhoy could have made a good pirate; instead, he became the enfant terrible of shopping mall tapas. He opened his first Tapas Revolution in London’s palatial Westfield, and soon spread his message north. Now he’s here to seduce the shoppers of Newcastle. Or at least he was last week. He sure as hell seduced me. I don’t normally review places when they’ve just opened. It isn’t usually fair on the kitchen. Mrs Diner and I had merely wandered in to look at the décor, all Spanish terrace and smart panelled bar, when I spotted him, carving the giant ham leg at the front of the kitchen. With a huge smile of welcome, he pointed at one of the tables in the centre of the restaurant. So I reckoned, with the boss in charge, the cooking could never get better than this. 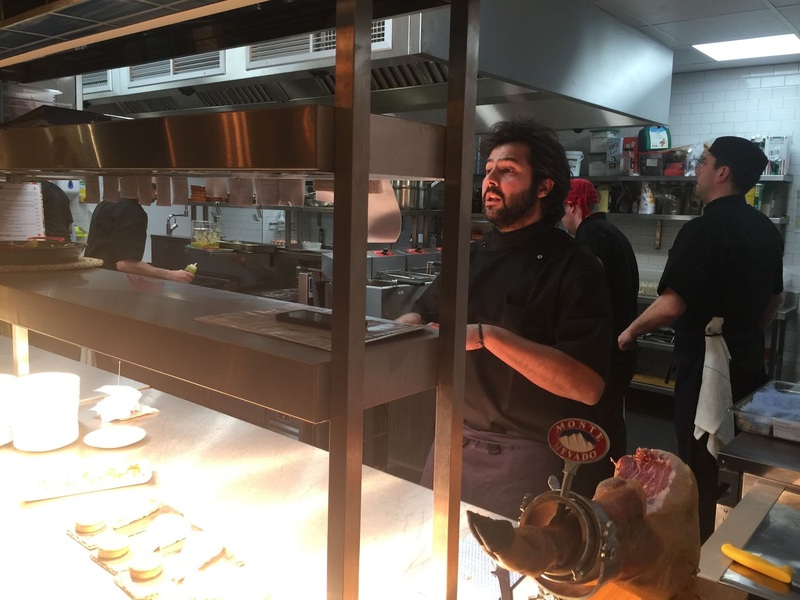 In fact, the whole national startup team were in, teaching the locals how to bring real tapas to Newcastle. Our charming waitress was walking down the row of tables, counting out loud. “50, 51, 53...” she went, stopping at our table. “I think we’re actually number 52,” I said, trying to be helpful. She was very young with an enormous infectious smile. 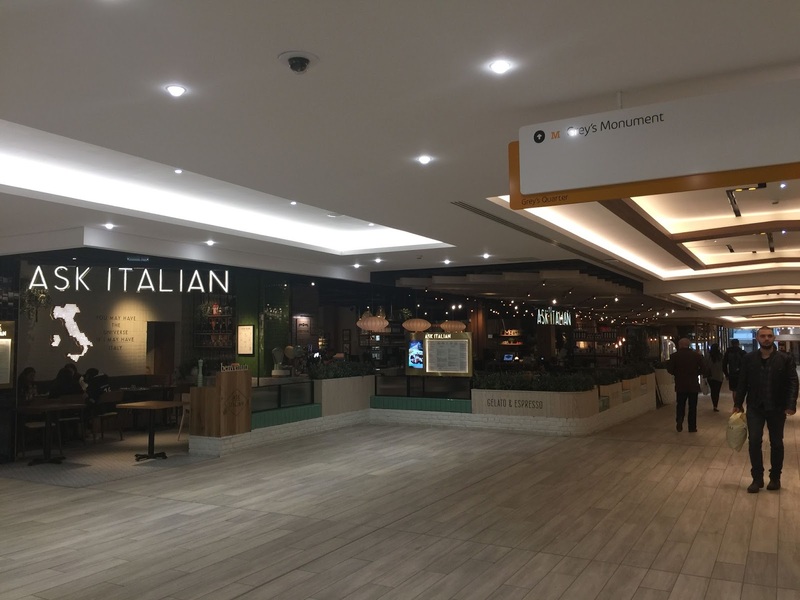 Italian, not Spanish – but who’s complaining? She frowned, looked back at her station and started counting again, eventually nodding in agreement. “Table 52 would like some of that Ibérico ham, please”. It was her first day, and the start of what I'm sure will be a magnificent career in catering. Meanwhile we watched chef Allibhoy carving away at his leg joint, forming neat, wafer thin rectangles of greasy, nutty heaven. The ham was £9.50 a portion, but it had to be tasted. 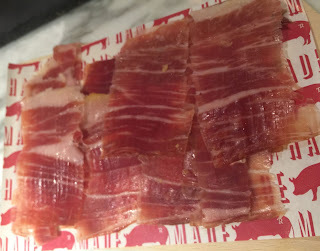 Spanish ham is the best in the world, and some of the finest is the jamón de bellota, made from pigs fed with a diet of acorns. 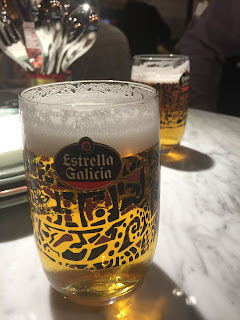 To be honest, this Monte Nevado ham was a little too subtle for the Spanish beer. 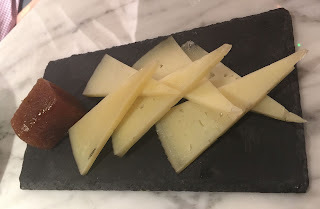 I should really have hit the wine list – all Spanish, with five each of white and red by the glass, or even a sherry, but we hadn’t planned a long lunch, just a quick snack, which is what tapas should be all about. Instead, the menu, the atmosphere, and the pirate chef changed all that. 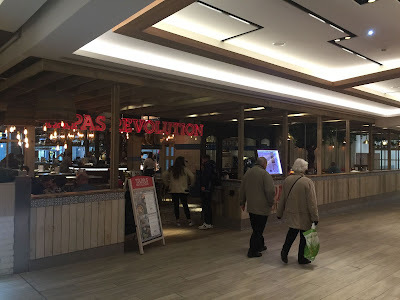 By the time the pan con tomate arrived, drenched with garlicky tomatoey goo, I was transported from the world of intu into one of those long sunny Spanish lunches you dream about on cold February days. Except the view from the window was grey, and of Greggs. The trick with tapas is to order so much that you completely forget what’s coming, so each arrival is a pleasant surprise. 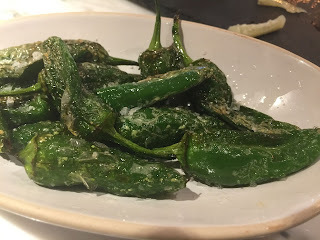 Bright green fried pimientos de padrón came first, flecked with crystals of salt. “Some are sweet, some are not!” warned the menu (in Spanish). All of ours were sweet. “More beautiful than Cleopatra,” I added unnecessarily, and finished the cuttlefish. Meanwhile, a jug of Sangria was brought to a large tattooed couple at the next table. People were really getting in the mood. We couldn’t decide between paella, of which there were four, or pork shoulder served pink, so I ordered both. 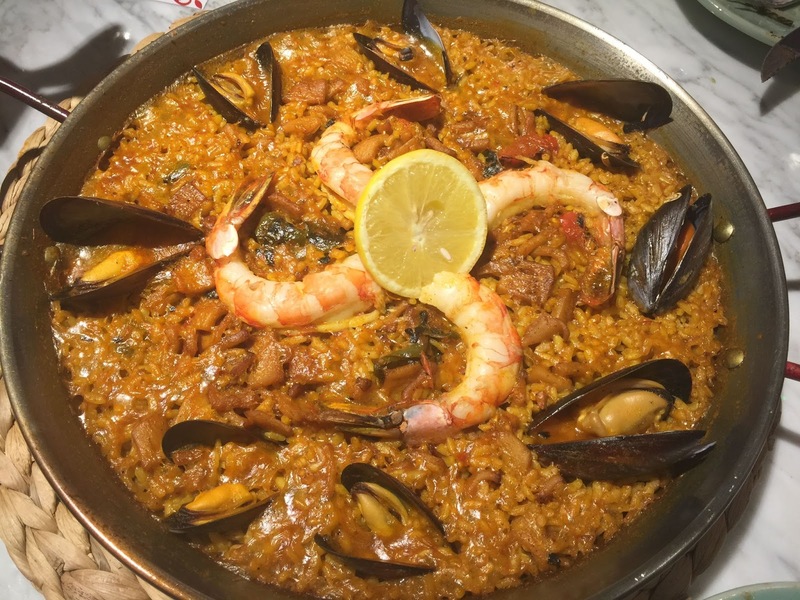 The seafood paella (£28 for at least 2) was epic. Seriously, a flavour as good as any I’ve tried in Madrid. Simple, with a ring of mussels, squid and pink, sweet prawns, its saffron and lobster stock had given the rice such depth and umami intensity it almost made me get up and salsa. Almost. Then the meat arrived. It could have been fine beef steak, cooked close to rare. But it was pork, from the same pig that brought us the ham, fed on acorns and Spanish sunshine. Well, maybe one of its cousins. 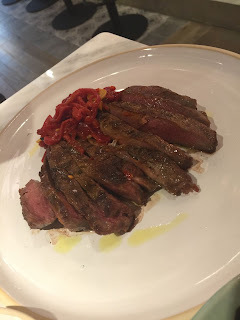 Served with its own juices and a little mound of sliced sweet, wood roasted piquillo red peppers, this was divine. 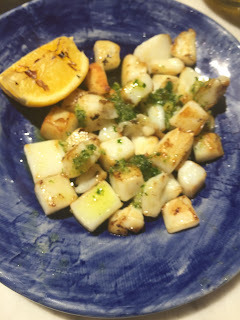 From time to time other things were placed in front of us: deep-fried squid, patatas bravas, that kind of thing. They weren’t for us. We were table 52, so they were politely redirected to the correct destination. 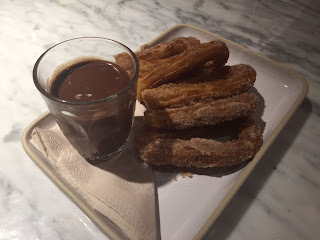 After the paella, a dessert was out of the question, so we ordered two: churros (dainty, horseshoe shaped cinnamon-imbued with the darkest, richest chocolate sauce for dipping) and torrijas - kind of Spanish french toast. This latter dish caused great consternation in the kitchen. They found a brand new blowtorch, but nobody had ordered the gas. A minion was dispatched into the cold air to locate a hardware store (not the easiest find in Eldon Square). Eventually he returned proudly, the crust of the torrijas was crisped up, and a crisis avoided. Deliciously. The ignorant hordes are already bleating about his prices on TripAdvisor. Yet the quality of ingredients here is absolutely superb, and that’s can’t come cheap. This is actually Newcastle’s first proper tapas bar and it’s fabulous – all the rest is just albóndigas. I really hope it works. Sounds great, worth braving the Square for! On the subject of high quality Spanish food in the city. Should you find yourself in Grainger Market again, El Casa is delightful and is run by two of the friendliest and most enthusiastic shop owners in the city.